Artist Vladislav Yeliseyev and Harmony Gallery join forces to raise funds for Sarasota Orchestra programs through exhibiting art works. 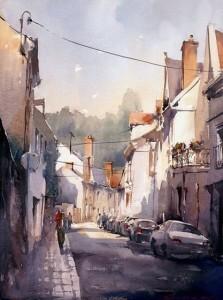 The exhibit includes impressionistic watercolor urban landscapes and cityscapes. (Sarasota, FL) “Urban Thoughts: New Works by Vladislav Yeliseyev runs November 3 through December 19, 2014 at the Harmony Gallery, 709 N. Tamiami Trail, Sarasota. The exhibit includes impressionistic urban landscapes and cityscapes in watercolor which have been remarkably popular over the last years. 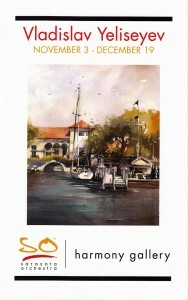 A portion of the proceeds from the sale of art will be donated to the Sarasota Orchestra. A reception, with artist, is November 6, 5:00 – 6:30 p.m. at Beatrice Friedman Symphony Center. Artist appearance is during the scheduled concert on December 11th. Gallery hours are Monday – Friday, 8:30 am – 4:30 p.m. and whenever the building is open to the public. For more information, call (941) 953-3434. Classically trained, Vladislav Yeliseyev combines an artist’s eye with an architect’s observation. After graduating in fine art from Moscow School of Arts, Yeliseyev earned his master’s degree in architecture from the Moscow Institute of Architecture in 1983. “My every work is a manifest of light existence. Understanding the nuances of light is a matter of life and death in landscape painting,” he says. Vladislav’s winning works were accepted in all major National and International Juried art competitions. He is member of American Impressionistic Society, National Watercolor Society, American Watercolor Society, Florida Watercolor Society; he is a Master artist of Light Chaser: Plein Air Painters of Sun Coast. Vladislav closely works with local non-profit organizations such as Historic Spanish Point, The Perlman Music Program and various schools helping them to raise the funds by donating his art and classes. To share his passion and expertise, Vladislav founded the Renaissance School of Art in Sarasota where he teaches a formal curriculum and educates his students in classical drawing and painting. In this exhibition, Vladislav will show his most recent works in watercolor inspired by urban architecture of places he recently visited. Being born and raised in the big city and studying architecture, the urban experience is one of the most exciting for Vladislav. “Capturing the mood and telling the story based not on facts but on subtle nuances of the scenery is my aspiration. I see my paintings as a testament to the natural sources of light,” notes Vladislav. To inquire or purchase the work please contact Yeliseyev Studio by calling (941) 330-6865.